Megan Murphy and Mills Gorrie were married at Mills’ family farm in Birmingham, AL. They knew they wanted a late fall wedding so that the guests could enjoy all the beauty the farm had to offer. Megan was so easy going and open to any and all suggestions. The thing that mattered the most to her was marrying Mills. Mills’ cousin was also married at the farm a few years ago so we knew the property well and were eager to get started. At the very first planning meeting, Megan mentioned she loved the color lavender. We showed her a lavender plaid linen that pulled in grays and a soft linen color. She loved it! From then on, the design plan focused around this one linen. We picked the prettiest view for sunset and determined it would be the perfect ceremony location. 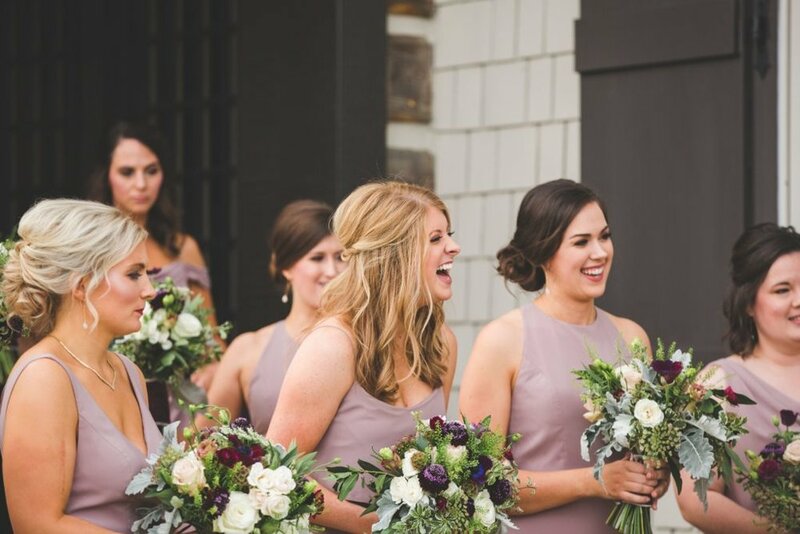 Mills’ mother, Allison, a designer, played a huge part in executing the custom pieces that made this wedding so special. Mills’ sister, Alli B., has the most magical voice and sang Amazing Grace after the seating of the mothers. Megan’s brother-in-law officiated the wedding. Megan said her favorite part about the wedding was having everyone she loved in one place. With so much love surrounding this couple, it was evident from the very beginning it was going to be a very special day. The reception was in a tent just a few feet from the ceremony. We constructed the tent for two weeks under the management of The Colonnade Group. We worked with this talented group for months making sure no detail was overlooked. One of the really fun planning aspects for Mariée Ami is the behind the scenes logistics. We call this the “engineering” of wedding planning. Some of things our clients may never think about on their own include questions such as where do the generators need to go to reach everything that needs power; where can we place the restroom trailers, food trucks and air conditioning units; what temperature will it need to be in order to avoid condensation in a clear tent; what is the path most traveled by vendors and how to prevent the grounds from getting destroyed before guests arrive; and how is the flow of traffic and the softness of the ground impacted after a week of rain. These are the “background” details we focus on that our clients never have to worry about. Most importantly, these are the details that if not dealt with in a timely and effective manner by experienced planners, can have a very negative impact on the event and cause added stress on the couple and their families. Working with a great team of vendors the overall design plan came together perfectly! Custom bar tops were made by Magic City Woodworks out of wood found in North Carolina. The bases of the bars were assembled with wood cut from around the farm. Magnolia tress so large they needed multiple men and machinery to move were brought in from Blackjack Horticultural. Southern Posies came in and dressed everything up with stunning blooms and unique greenery. The linens, pillows and furnishings were the icing on the cake. Everything was stunning. The fabulous design set the mood for an exceptional reception! Guests indulged in small plate entrees by Shindigs and danced the night away with Atlanta Showstoppers. It wouldn’t be a Mariée Ami wedding without a sugar high from Barb’s Cakes. As if all of this wasn’t enough, The Waffle House food truck showed up to serve pancakes and bacon for late night. Eats. No one left hungry! As we walked through the reception, we could hear the chatter of happy guests enthralled with the entire event. We were so excited to work with such a sweet couple and honored to be included in this marvelous affair. There is no greater moment as a planner than to stand in the back of a wedding and watch everyone enjoy the fruits of your labor. Megan and Mills were so appreciative and gracious of all the hard work the entire team put into their wedding! We were thrilled to be a part of their special day and will cherish this friendship forever.